Our house is filled with books of all kinds. As a teacher, I have books from all different genres that I love to expose my children to. We read lots of fiction, stories about holidays, poetry and books about historical people, places and things. This is part of the reason that my son, a first grader, has already read over 100 books in two months of school (the goal for the year). I was recently sent two complimentary new books in the Touch the Art Series from Sterling Publishing to read and review with my first grader. These sturdy board books are very different than any other that we own. Not only do they allow children to touch art, they utilize real artwork by famous artists. My son immediately wanted to see what there was to explore on each and every page. He quickly realized that there was more going on in the story. He asked me about the artwork on the page. When we finished the story we went back to each of the pieces of artwork and read the Artifacts about each of the pieces and their artists. My son also recalled prior experiences that related one of the titles that revolved around an Egyptian theme (we went to a mummy exhibit a few years ago). Experience the wonders of ancient Egypt! This long-gone civilization will come alive for kids when they actually feel a gold coffin with the tomb of the legendary King Tut, the scratchy pyramids at Giza, the gauzy covering on a mummy, and Nefertiti’s jewels. It’s a really cool way to make both art and history accessible to even the youngest children. What we thought: My son was fascinated with the items that were on each page. He especially liked feeling the linen that the mummy was wrapped in and wanted to know more about the process. I told him that next week when he is home from school for Veteran’s Day, we will work on a Mummy project and write in hieroglyphics together. My son also recalled going to see a mummy exhibit in our local museum. I enjoyed the book because of the history that it presented and then the further explanation in the Artifacts section at the end of the book. I can not wait to read and explore more Egyptian art with my son in the upcoming weeks. What we thought: The rhyming repetitive chatter of the rooster in this book had my son guessing where it was hiding. He loved all of the items to touch and enjoyed the high quality art from the masters.His favorite was A Couple of Foxhounds because he liked the silky dog ears on the page. I loved that this book introduced by son to the works of artists like Pablo Picasso, Grant Wood, Henri Rousseau, Albrecht Durer, Franz Marc, Milton Avery, George Stubbs, Vincent van Gogh and Romare Bearden. 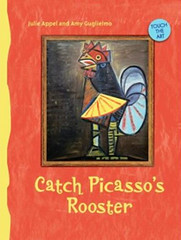 We already plan on taking a day to experiment with the cubist style of art to create something like Picasso’s Rooster. While doing research about the books, I was fascinated with the story of how Amy Guglielmo and Julie Appel met and started to create the Touch the Art series. You can read about them here on their website. I love how committed they were to expanding art appreciation to children. This is even more important now that many school district budgets are being cut and the arts are often the first to go. If you are a parent or teacher and would like to purchase these books they are available from Barnes & Noble. Previous titles include Pop Warhol’s Top, Brush Mona Lisa’s Hair, Feed Matisse’s Fish and Make Van Gogh’s Bed. Coming in June 2010 look for Count Monet’s Lilies and Find King Henry’s Treasure. 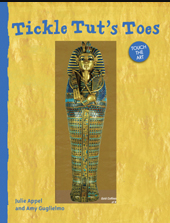 Additional resources, projects and more for parents and teachers to use with these books can also be found on the Touch the Art website. Disclosure: I received both of the book complimentary of Sterling Publishing in order to facilitate this review. No other compensation was given. The opinions expressed in the review are my own. AWESOME! I am giving my nieces, who love to read totes for them to carry all their books in when they go to Grandma’s house- Perfect price point! .-= Susan´s last blog ..Lost. =-.